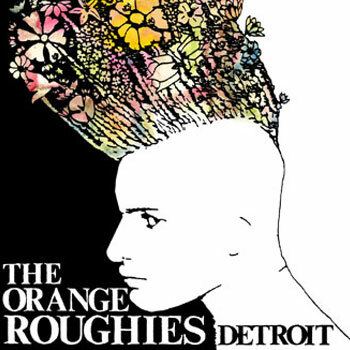 The Orange Roughies were formed in Detroit, Michigan, circa 1986, from Drew Malburg (drums) and John Pineau (vocals) from the band My Sky and David Feeny (guitar) from the Hysteric Narcotics. Don Gierlach (bass), a recent transfer from Pittsburgh to Detroit, was added to complete the four piece. From the beginning the band pursued a heavy live performance schedule, and were soon seen playing with other Detroit bands including The Vertical Pillows, Sleep and Angry Red Planet After a year, the Roughies started touring regionally, added another Tremor Compilation track as well as tracks on three other regional compilations. The Roughies became a headlining mainstay in the Hamtramck/Detroit Alternative scene and shared the stage with countless bands such as The Pixies, The Romantics, M.D.C., Red Lorry Yellow Lorry, Robin Tyner, The Bodeans, Material Issue, 13 Engines, Blue in Heaven, Viv Akauldren, Sleep, Junk Monkeys, The Gories, Screaming Blue Messiahs, Map of the World, The Toll, The Godfathers, Rhythm Corp & New Model Army. In 1988, Pineau and Mary Restrepo (Vertical Pillows, Detroit Cobras), went on a mission to find Robin Tyner, the singer for the MC5. They found him and his wife hosting an after hours coffee house and open-mike stage in a Church in Detroit’s Cass Corridor . Pineau offered to have the Roughies play the nearly empty church for free if Tyner would sign a copy of the MC5’s first album. The record was signed, a show filled the church, and Tyner began working with the Roughies and Pillows on everything from stage to studio. The Tyner boost, the growing reputation of the band, and favorable reviews and airplay for their single “Eyepatch” brought serious interest from a dozen major labels and the Roughies began playing showcases from Chicago to New York for Elektra, Capitol, Atlantic, Profile and other labels. The Roughies signed with Nocturnal Records, distributed by Rough Trade, in 1988. The band then took full advantage of Feeny’s growing skill as a recording engineer and finished their first album in a variety of Detroit area studios including Feeny’s parent’s basement (which would later become The Tempermill). Keith Soucy (bass) was added for the recording, with Feeny recording and Tyner mentoring. In 1989, Knuckle Sandwich, was released to solid reviews and charted on college stations across the country within weeks of release. The album charted in the College Music Journal’s national “Top 100” less than 60 days after its release, and held number one chartings at college stations on the eastern seaboard, and in the west, particularly the northwest. In 1989, the Roughies added Glynn Scanlan (bass) from the Idiots, and began their first national tour in 1990 which took them from Detroit west to Hollywood, north to Seattle, east to Boston, south to Texas, and all places in between. After several rounds of touring, the band returned home, recovered, and began recording a second album, but Pineau, age 30 and engaged, left to return to school. The band played its last show at Paychecks in Hamtramck, Michigan, on August 2, 1991. The material from the second album is now released in 2012. A double CD (21 songs) that contains ‘Knuckle Sandwich’ (1989) and the never released ‘Spilling True Love Everywhere’ (1991) both have been lovingly re-mastered from the original tapes and are finally available!